an absolutely glorious day has broken here this morning. 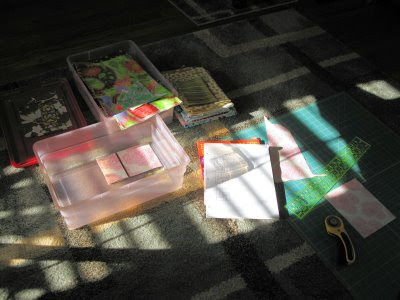 i'm squeezing in a little scrap therapy before i head out to plant some herbs. ...that i will then piece for a 16" x 40" coffee table runner and a set of six coasters for my niece. see that yummy sun coming through my window! i'm also going to sneak in a "spring" bag for myself, probably the swing with a few modifications as i gave the original to this same niece (yep, i like to sew for her!) as they were her colors. mine will most likely be from this wicked cool fabric (specifically, the js11 & js12 midnight). yeah, tee has no idea how black shouts spring. just wait and see! Those are such lovely pieces of fabric! The tablerunner and coasters are going to be fantastic. 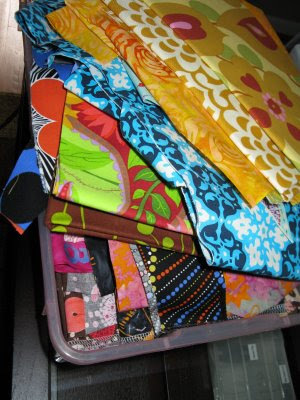 I love the fabric you are thinking of using to make a bag for you. It feels like spring to me! Have fun playing with that fantastic fabric! oh, sounds like a great project! sounds like some great weather you are getting! Love that midnight fabric, that's going to be so awesome!!! The table runner and coasters will be really cool to with all those scraps, can't wait to see everything. Happy Sewing! As I've always said, you just have a way with color, girlfriend! Did I see a little peek of the bag on FB yesterday? I think I did! Cute, cute! And I would never think of doing a tablerunner, of all things, AND coasters! What cute ideas. Just can't wait to see! And, BTW, your sewing room in the past post is so CLEAN!! It makes me want to go clean mine. I'm always swooning over your fabric! Love the fabrics! Can't wait to see the finished products! you are really making me want to get out my rotary cutter!!!!!!!! a table runner and coasters! what a lovely gift!